The police are now treating a fire at a GAA club in Londonderry as arson - despite initially saying it was not started deliberately. The PSNI statement came after Sinn Fein said CCTV footage showed hooded masked men outside the building just before the fire started. 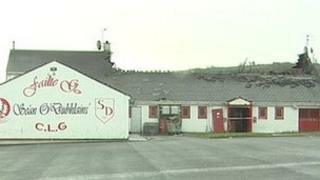 Extensive damage was caused to Sean Dolan's in Creggan in the early hours of Wednesday morning. Police have said a senior officer will review every action taken by officers. They said the review would start with "the first call received about the fire, evidence taken, CCTV footage viewed and lines of inquiry followed up by the investigating officers". "We would encourage anyone with a concern about police action to report the matter to the police ombudsman's office." Earlier, Sinn Fein assembly member Raymond McCartney said CCTV footage showed hooded men outside the building before the fire started. "It was absolutely arson in our opinion, we have said that from the beginning," he said. "The PSNI made a statement on Thursday that this fire was not suspicious, indeed they said it was an accident. "When you examine the CCTV footage which was in their possession, then there are suspicions around this and I think this will lead to an investigation." His fellow MLA, Martina Anderson, claimed those behind the fire had carried out other attacks in the area. "These are people who are running around our community, have attacked community workers and the talk in the Creggan community is this is the same organisations and personnel who are involved who have now attacked a GAA club," she said. The Republican Action Against Drugs group said allegations that it was involved were "scandalous and unfounded". "This is not the first time they (Sinn Fein) have publicly blamed us for different attacks that in time has been proved that we were not involved with," the group said.